We’d love your help. Let us know what’s wrong with this preview of Mystical Wonders Survival by Karen Cino. Shari's home is the center-point of the story, the only one, which isn't submerged under water. Madison and Dino are trapped in their crawl space as water has swept through home. Sophia is at work when a tidal wave hits and she is swept away, holding on to the chandelier for dear life. Cassie and Antonio are stuck in the police precinct, with the only way out is climbing t Shari's home is the center-point of the story, the only one, which isn't submerged under water. Madison and Dino are trapped in their crawl space as water has swept through home. Sophia is at work when a tidal wave hits and she is swept away, holding on to the chandelier for dear life. Cassie and Antonio are stuck in the police precinct, with the only way out is climbing through the metal grate in the ceiling up to the floor above. Fay gets from Italy to England where she is trying to get a flight home to make sure her daughter Heather and her friends are safe. To ask other readers questions about Mystical Wonders Survival, please sign up. I received this book in exchange of an honest review. I always enjoy a good survival story and this is definitely one. This is a story about strong women, who do what they need to in order to survive and help those they love. These characters are well-written and well-developed. The story interested me from the start and I quite enjoyed the way the plot developed. 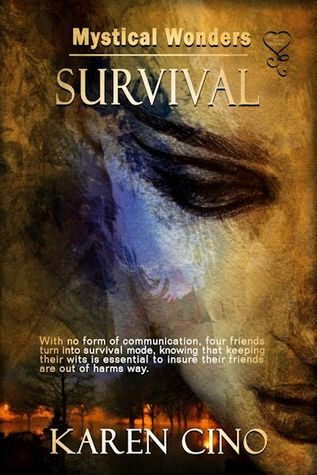 If you like survival and contemporary stories, you might enjoy this story. Her daily walk is what gets her muse going. It clears he Karen Cino is an author, poet and former journalist. She’d been writing since she was fourteen years old. She started her career by writing poetry, short stories and articles for her high school newspaper and the Staten Island Register. After reading Jackie Collin’s “Lovers and Gamblers” she knew she found her niche, writing women’s fiction. Her daily walk is what gets her muse going. It clears her mind and helps her find realistic plot ideas and characters, boosting her muse. She loves writing about local places that people can relate to. Karen is married, has two adult children and lives in Barnegat, New Jersey with her husband. She’s a member of romance Writers of America, Women’s Fiction Writing Association and Liberty States Fiction Writers.